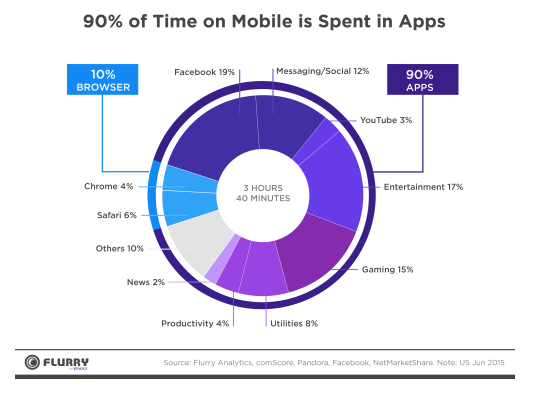 90% of all mobile time is spent in Apps, is your content there? We all know that Facebook is the main reason so much mobile time is spent in apps, but what can publishers learn from it? Users prefer apps! Did you know that research suggests up to 90% of all mobile time is spent in apps? A key difference between successful content apps like Facebook (Twitter, Instagram) and traditional publisher apps is the constant source of fresh content available. Users of social platforms have created habit forming behaviours (opening the app regularly) and are not waiting for weekly or monthly editions like with traditional publishing models. This increasing on demand economy is all about “now” and “transparency”. Continuous publishing (as well as editions) is now possible in modern mobile publishing platforms so publishers can mimic the benefits of the world's most successful apps at a scale that is relevant to them. Replicating some of what makes those apps successful means publishers can create an engaging reader experience for their customers. Publishers should be delivering their content to wherever their audience is. This includes distributed content and social channels, third party apps (Facebook, Twitter and Instagram), as well as their own branded app because apps now offer the most popular mobile experience. Owning content channels is extremely important when trying to build deeper engagement and when it comes to monetising content. The home screen icon means content is always only a tap away. Push notifications allow publishers to remind readers to open the app. Statistics also show that it boosts app engagement by 88%. Offline reading – No wifi? No problem! Content is always on. Background downloads, content is always up to date! App publishing is a fantastic way for publishers to experiment with the mobile publishing opportunity without the overheads of print. Use existing resources and plug web content feeds into apps so that every time the website is updated, the app is also! Create special editions and packages based on archived content. Capture media ‘moments’ by publishing digitally in a matter of minutes and push content to the world. Apple and Google are also both investing to ensure apps work better on their platforms so content is more discoverable now than it has ever been before. Branded apps gives publishers the chance to engage with their audience and distribute content across all platforms. Publishers should consider this as an opportunity to experiment with digital and mobile publishing if they want to build deeper relationships with their existing and new readers. After all, we live in a demand based economy where consumers are looking for instant information. So we ask... is your content there?